When people think of home improvement, most think of remodeling or drastic renovation that costs a lot. Contrary to these ideas, improving the quality of your home starts with a single concept according to most interior decorators: increasing space. As simple as those two words sound, they are probably the most difficult to accomplish in terms of house design and decorating. However, there are ways to make this home improvement goal possible with the least amount of cash and effort. Starting with the most visited room in your house sets the tone for your project. The bathroom is the most overlooked place in the house in terms of design. The common excuse of homeowners is that visitors do not really see the inside of the bathroom unless they ask to use it. But design experts argue that this should not be the case. The use of the bathroom is gradually changing from being functional to aesthetic. It is not only for bathing and other bodily functions but also for relaxation and de-stressing. It is important to keep the dual nature of the bathroom’s function in mind as you go about your home improvement project. Increasing bathroom space has a lot to do with ceiling and wall dimensions. However, you do not have to remove walls or reconstruct your ceiling as part of home improvement. Simply placing borders along the conjunction of your ceiling and walls is often enough to “increase” their dimensions. The color provided by the border tricks the eyes into perceiving more space. Using wallpapers or tiles with vertical stripes or dainty prints also makes the room appear taller. If you are not using tiles or wallpapers, painting the bathroom ceiling and walls with a neutral shade illuminates and broadens the space. Plain white looks boring, and designers advise the use of other shades like ecru, beige, and oyster to update your bathroom’s color. As much as bathroom space relies on walls and ceilings, floor space is just as important. Uncluttered floor widens visual space so keep this in mind in furnishing your bathroom. Instead of standing cabinets which interrupt floor space, install floating cabinets and storage spaces. Mount vanities in walls and choose claw-footed tubs instead of flat-bottomed tubs. These maximize visible floor space which is essential in any home improvement project. Painting floors in neutral shades or getting them a woodwork finish is best to increase space. 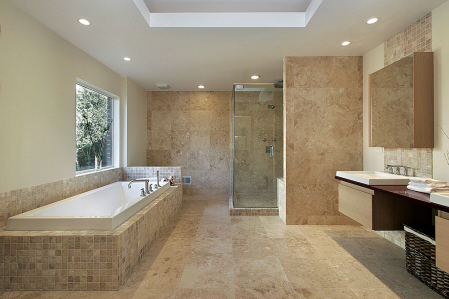 Using light-colored tiles need more cleaning but gives your bathroom the illusion of being wide and spacious. A home improvement project is not complete without furniture. In choosing bathroom fixtures and furniture, go for those that are slim and sleek. Go for the modern fixtures in chrome or silver. Installing mirrors also add to room dimension by giving the illusion of space. Put in a window to let natural light in. Not only does natural lighting make everything look fresher, but it also illuminates spaces better. No matter what path you choose to take in the crossroads of home improvement, it is imperative that the room’s function is not hindered by its aesthetics.